We had a saying at my former employer, there are no small shows - just small budgets. In other words, every show is extremely important to someone. Applying the theory to business, the only small companies I have ever encountered were ones that disconnected themselves from the rest of the world. In July at the Rental & Staging Roadshow in New York, I met no one from a small company. There were a few whose revenues were less than others - but simply by taking the time to be at that event and then choosing to interact with other companies that were there, those "small" companies increased their relevance tremendously. That is the power of networking. Ask a first-time attendee to InfoComm, the Roadshow, or any other trade show why they are going, and you will probably get a response related to seeing new equipment or education opportunities. Ask a second-time attendee and their answer often changes to networking. By the third time they may even be able to explain what that word means. Sales folks have long understood the value of networking - but primarily in a business development sense: attend gatherings, meet people, get referrals. Successful principals and managers know that encounters with competitors and colleagues yield information, knowledge, and experience that can be put to work on Monday morning. "That's why I don't participate...I don't want anyone stealing my ideas." I have heard this too many times from what I would characterize as unsuccessful businesspeople. In today's society almost everything we touch is the product of collaboration or at least owes its existence to a collaborative effort. If you disconnect yourself from that pool of knowledge - then you won't accidentally contribute to it - nor do you get the full benefit. Knowledge sharing leads to collaboration, which leads to improved knowledge and so on. Networking is the first step in the process. In short, why make the same mistakes other companies have made when all you have to do is ask. In exchange, you tell them something you've learned. Those companies that are not including themselves have higher costs and longer development times for their innovations, assuming they have any. What would you pay to not make a mistake others have made? We you share one of your successes or mistakes? (For a good read on this subject pick up Thomas L. Friedman's The World Is Flat - A Brief History of the Twenty-First Century, Picador, 2005). "I just rent gear and do some shows. I don't need a lot of socializing." This statement is usually followed by a comment about letting the Salesmen get out and about, "they seem to like that stuff." I know that social networking is not for everyone, but when I hear comments like these I wonder why this person is in business in the first place. Where is the excitement and passion? Meeting and talking with new folks and old colleagues can rekindle almost anyone's enthusiasm for business. This is a good point to mention that virtual networking is not the same. Websites like LinkedIn, Facebook, and MySpace do serve a networking function, but it is generally not the level of practical information exchange that face-to-face meetings can lead to. Use groups and Blogs serve another purpose that often includes collaboration. Many AV companies have developed these kinds of tools internally - but I am not aware of anyone who has opened their forums to the public - yet. Owner 1: "Delivery costs are killing us. It's not like the old days. What are you guys doing about it?" Owner 2: "We started subbing out local deliveries, but those drivers couldn't handle the last minute order changes so we...."
When I walked by twenty minutes later, these two guys were still talking. They may not have found all the answers, but they know a lot more than they used to. It seems only polite to inquire how everyones summer has been. This months survey asked just that and we received our largest response ever. Could it be that people have some free time on their hands right now? 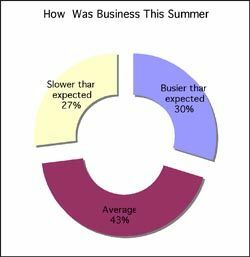 Of the companies we polled in our survey, 30 percent said that business was better than expected (see chart on this page) but that may not be all that busy. According to our respondents, only November and December are slower than June, July, and August. In our down time we focus on education which has been a key asset to our growth and quality of work. Greg Perry, Staging Manager, Everett Hall Associates, Inc.
We keep all options and markets open. Keeping in touch with the fundraising and non-profits is a good way too keep busy during the off months. We also try to keep some special services in our cache. Dave Howell, Managing Partner, Velocity Audio Visual, LLC. When it is slow we plan and prepare for the busy months. When it is busy we work hard and maintain a good financial plan so the slower times are enjoyable, Richard Miller, Oasis Coast to Coast AV Support. The complete results for this survey includes many more quotes from the respondents. It can be downloaded from the Surveys page at www.trstimson.com.